What do ShayCarl, iJustine, Nicepeter, HappySlip and MysteryGuitarMan have in common? 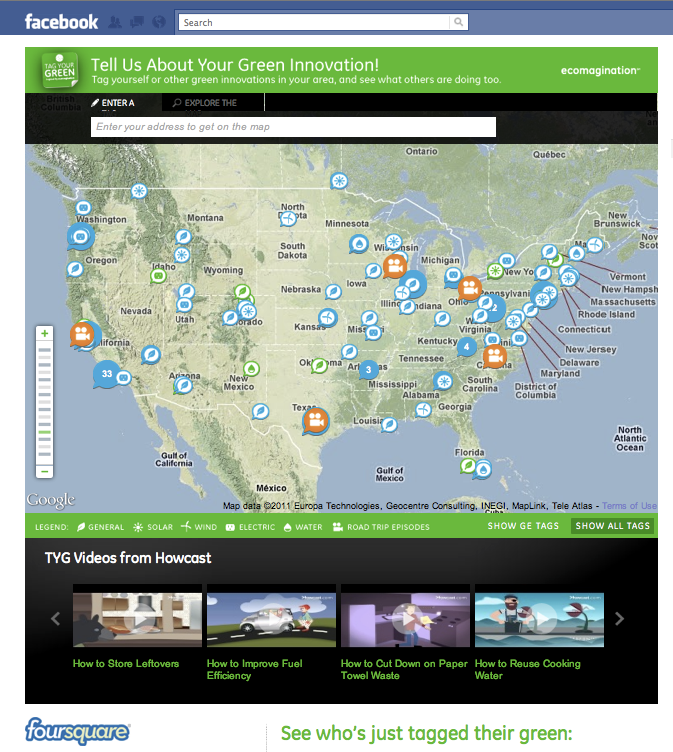 The YouTube (s GOOG) stars are all part of GE’s (s GE) new Tag Your Green Ecomagination campaign that’s supposed to get people excited about green technology and, in turn, brighten GE’s image a bit. The campaign has been produced by Howcast, and it’s the third time Howcast has helped GE leverage the power of online video. Last year, Howcast had the goal of driving 10 million views on YouTube for GE’s first Ecomagination campaign, Howcast’s VP of Strategic Programming Jeffrey Kaufman told us in a phone conversation. To date, that campaign has led to more than 15 million views and counting, thanks in large part to the power of prominent YouTubers, who produced a number of videos for GE. However, this time around, Howcast chose an bit of a different approach. Instead of just asking the YouTube A-list to chime in on being environmentalists, it developed a mini web series starring ShayCarl that has the comedian visiting various places around the country to highlight green technology. One of the stops has him visiting the California Academy of Science in San Francisco, while another has him trying out a solar-powered carousel in Austin, Texas. And of course, he also stops by a GE plant or two. Along the way, he;s joined by a number of YouTube colleagues, who appear in the videos for short cameos. Some will also produce supporting videos, explained Kaufman. ShayCarl’s videos won’t just live on YouTube, but also on a map on Facebook that’s the centerpiece of the campaign, inviting users to add green projects in their own neighborhood. “It’s the most exciting when the most people add themselves to the map,” Kaufman said. Howcast also features a number of its own how-to videos throughout the Tag Your Green campaign, for example, encouraging people to reuse cooking water for the watering of potted plants. These kinds of how-to videos are what Howcast is best known for, and that has turned the company into one of the biggest publishers on YouTube. So how do how-to fare and branded content like the videos produced for GE fit together? Kaufman said he wouldn’t draw a fine line between these two areas. Howcast has been working with various companies, including Staples, (s SPLS) Home Depot (s HD) and of course GE, to produce branded content initiatives. At the same time, it has been busy producing between 8,000 and 10,000 pieces of original Howcast content. “Even the stuff we do for ourselves is not created in a vacuum,” said Kaufman, explaining that the company is working with a number of distribution partners and on lots of different media formats that closely mirror what the company is ding for partners like GE. In a way, all off this is also branded content — except it’s featuring the Howcast brand.